"We knew that there was a war. But not to such an extent. "Interview with prisoner Timur Olevskii, car mechanic from Adygea, who was a tank driver for "LPR". The Security Service of Ukraine say that they detained a Russian citizen by the name Hajiyev from Stavropol territory. According to the SBU, the Russian police asked him in order to "make up for" the theft of a car - that he should travel to the Russian city of Donetsk and help with the re-activation and repair of armored vehicles. Information about this appeared on the website of the SBU on Friday, January 30th. The same information is now confirmed by Hajiyev himself. In an interview with TV Rain Timur Olevsky he said that he had worked as a car mechanic. In late December, he was allegedly arrested on suspicion of stealing a car and then threatened with a criminal case. But instead he has been sent to the territory of Ukraine, where he became a tank driver in the 'separatist' armed group "August", stationed in the town of Krasnyi Luch. - With your permission I will ask you a few questions, the staff allowed me to do it. The only thing I want you to notice - it is in any case not an interrogation, and if there are any questions I ask that you do not want to answer - you don't have to answer, it is your right. Tell me who you are? - Ruslan Hajiyev Dzhubalaevich, born in 1973 on February 10, a native of the Russian Federation. - Under what circumstances were you arrested, can you tell? - We had a confrontation with the Ukrainian military, where my tank was hit, and I was taken prisoner. - How were you captured? - Before that we have been driving in a column to Bryanka from Krasnyi Luch. In Bryanka we spent the night, we were given the order to drive this column to the village Sazhenskoe, so we did. In the morning, they announced another order - where to drive the column into the wilderness, where to place the fire and where to retreat. When we went to this place to shoot, we can say we were shot at at close range. - When this happens, you remember what day? - It was on January 25th. - That is recently. Someone died in this column? - Yes indeed. All of my crew. Another four tanks, standing in front - all completely dead. - What happened with the rest? - I did not see what was going on behind me, I was stunned. - What did your crew look like? - We had a commander, gunner and driver-mechanic. - You know if they are citizens of Russia or Ukraine? - The commander, I just got to know three hours before the action, the gunner I knew a little longer, he was from Krasnyi Luch. - So there was no coordination in the team? - You drove the tank? - You somewhere learned how to do that? - Maybe you can clarify - whose tanks they were, do you know? Can you tell me what you think, from where these tanks came? - I have more than an idea, i know for a fact. These were tanks of the Russian Federation, because exactly one month ago, maybe a little more, they were transferred from the (Russian) city of Donetsk, between Donetsk and Rostov. They were transferred by the guys from my team. - So you know it from their own words? They told you about it? - And how did you end up in Ukraine? - I came from the city of Rostov-on-Don, I went there from Krasnodar, so to say, on a vacation. - Tell me more about it. - My friend and I were drinking in the garage. The neighbor went to sleep, we hadn't had enough. We took his car and drove for more alcohol. Just ten minutes later we were arrested by the Rostov police. We were brought into a chamber. I sat there for 12 days. After that, I was called and offered either to go for two weeks to the city of Donetsk of the Russian Federation, where there is a convoy that needed to be cleaned out of grease (grease dense, it is covered equipment, located on the long-term storage for corrosion protection - Rain) . Or else they threatened I would go to prison for a half to two years. So I agreed, and two other men from the chamber too. We went to Donetsk. When we arrived, this column was not there. But there was a military-type vehicle GAZ-66. 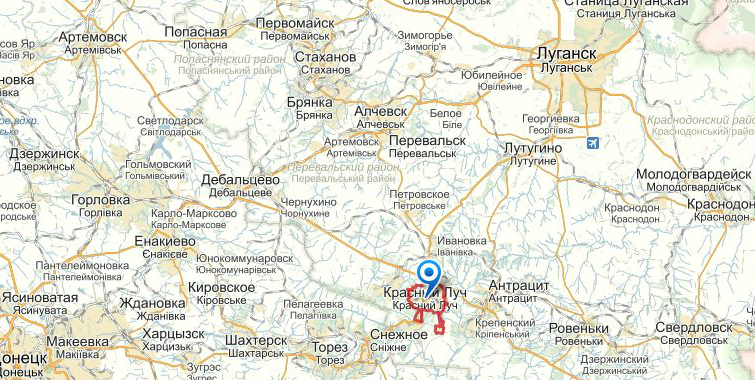 We were told that the convoy went to Krasnyi Luch. After another hour and a half, people came from Ukraine, they put us in an "UAZ", and we were taken to Krasnyi Luch. - Have you had the opportunity in Russia to escape, for example, in Donetsk? - Yes, we had, but no one thought that this all was so serious. We were even given passports in Donetsk. - You departed with your own documents? - Did they promise you money, or anything else? - No, just to close the case. - In exchange for freedom you were offered to wash the grease from vehicles. Who was the one who made you this offer? - I do not know his name, but it was a major in a police uniform. It was in the city of Rostov. - It was a detention center, police department? - We were brought there drunk, it was dark. But later they went to ordinary chambers. - The criminal case or your detention was documented at the time when you were in the chamber? - There was a protocol, you signed it? - Your detention in that chamber must be recorded in the documents, right? By the law enforcement agencies of the Russian Federation? - There was just an interrogation. I told him how I got into this car, and I signed this protocol. - You were given a file number, or something like that? - You were provide with a lawyer? - You did not talk to a lawyer? Not once in those 12 days? - You demanded a lawyer? - First it was explained to us that we just sit for some days (administrative arrest for up to 15 days to the Administrative Code - Rain). Then, when we were asked to go to clean the vehicles, we were told that this was not an administrative, but a criminal case. - Have you communicated with family and friends? - There was no such possibility? - In Russia - no. And here, in Ukraine I have contacted my wife and said that I am a mechanic, and that in two or three weeks I'll be home. She told me to come immediately. - When you were on the territory of Ukraine, among people who were transferring this tank convoy, did you understand when you could leave the job and walk away? You have been explained the beginning and end of your tasks? - We were told that it would take 14 days. Two weeks and that's it. And after two weeks - or even a little bit earlier - we asked to return to Russia. We were told that there was a martial law now. And not only we can not go back, even those who serve under the contract, can not go to the dismissal. - You talk about the presence of the Russian army contract servicemen? - No, just contractors - who signed a contract. - With the battalion commander, from Lugansk. Do not know exactly. - Those who signed the contract. We were not provide with a contract. - Did you encounter Russian military? - It's a fact that they came from Russia, yes. But whether they serve or not serve Russia here, I do not know. - You was somehow explained where these tanks come from? - We were told that they are transferred from the firing range from the Rostov to Krasnyi Luch. Why it's done, no one explained, and no one ever needed to know. And then everyone realized, where the tanks were going. - They were with ammunition? - It was assumed that then they would be driven by another crew? - Yes. The guys who transferred them, did not have to go to battle. Later they actually had to. They were told just to transfer the tanks to the battalion, and that's all. And to do service and repairs of these tanks. But later, they still had to remain their drivers. - As this battalion was called? - Who is the battalion commander? - What the name of the battalion commander is - nobody knows. His callsign is "Bee". - You before your convoy was shot, you met the Ukrainian army? - What was told about the Ukrainian army? - The security forces were shelling the outskirts of the city of Donetsk, and another city, whose name I have forgotten. Of course hitting civilians, schools, kindergartens. - Until the moment that you were driving in that tank column, did you see real battle? - Have Ukrainian investigators described you your future destiny? Suggested something? Told you what to expect? - Do you hope for prisoners exchange? Do you want to be exchanged? - I'd like to, but I don't have hope. - Do you have a lawyer here? - Yes, from the moment I was taken to the SBU. - Tell us how you were arrested? - I do not remember this moment. I know that there was a command to get out of the tank, which I did, and a command to go on the ground.Then we were loaded into the BMP. I do not know where they took us. I didn't understand anything for a couple of days, I guess. And only then I realized what had happened. - How many people you know came to Ukraine in the same way? - With me - three, all from one place. - If you met the officer who sent you here - if I understand correctly it was a Russian law enforcement officer - would you recognize him? - Did you think your life was in danger? - Do you know something about the war in Ukraine before you came here? - When did you enter Ukraine? - 23 January. Until January 20, servicing tanks. - How is the logistics of tanks? Spare parts are brought in from where? Gasoline come from? Nobody brings parts, there are broken tanks. Their parts are removed and placed into another tank. Ordinary fuel trucks bring diesel. - Why do you believe that this is the Russian tanks? - Because the guys that transferred them said so. - Do you know where and when the tanks obtained ammunition? - Have you seen other weapons beside your tanks? - Yes, BMP, BTR, SAU (self-propelled artillery - Rain) , anti-aircraft guns. We went to a SAUs crew for wrenches, and had some time to get acquainted with them. - And who served those SAU, who are these people? - We only went to them in rare cases - to take something or bring something. - Where did you live in what conditions? - Old warehouses, there were boxes, they lay board there and mattresses with blankets on top of it. We ate in the ordinary dining room, right at the base, where our battalion was. We went there ourselves three times a day. On the base we could move freely but we could not get outside the territory - there were guards, and stun mines. We have repeatedly seen how they work. - Anything, even the dog. - Have you had the opportunity to sign a contract? - No we haven't. Those were only for those who officially came by themselves and asked to serve. They were given IDs, to us - not. They received a salary of 360 dollars a month. - And the rest of the people who served with you - somebody told you, where they were from? - Everywhere. From Krasnyi Luch, from Krasnyi Don, the villages. Even from Kiev, some even from the Urals. All nationalities. - There were people who wanted to get away from there? - Yes, as a rule, they were waiting for wages, wrote a report and left. - And they could leave without any problems? - More or less good people they did not want to let go, they tried to persuade them. But who came there to drink pure vodka for three months - those were expelled. - How does the investigator qualify your actions? - As belonging to a terrorist group. - Do you feel the person involved in a terrorist group? - If I was involved in a fight, then of course. - Do you feel guilty? - Why? You did not shoot. - I did not shoot. But I drove a tank, on which there was a gun and two machine guns. Enough to feel guilty. This translation has unprofessionally but enthousiastically :D been realized with the help of @friendlycompass @uwwauw @chvjak and @useroftruth. Thanks guys! If you see any errors or have better suggestions, let me know. And this particular one is the most extensive reports we have so far and as such valuable. There is a video of tank drivers just before they go to the Debaltseve battlefield. And MAYBE this guy is there? The spot under his left eye (for viewers right) is not visible in the video, but I think this may be a small wound obtained after the video was made. He also has a wound above his left eyebrow. The only thing is that he himself mentions a village Sazhenskoe where they had been going. But there is no such village. There is a village Sanzharivka (were this video has been taken), so he might have remembered the name wrong (a good indication that he is not a local indeed :D). In the video he does not look too worried that he has to go to battle in any minute soon. On the other hand the instructions DO sound like they have absolutely no idea what they are going to do (a curse after every half sentence). Also see: Major Russian defeat near Debaltseve.